He meticulously describes various movements used, their desired effects, and the truth behind the rider’s role in each. In addition, he unveils his recommendations for dealing with the horse’s “natural crookedness” and “false bend,” providing basic guidelines for schooling that ensure correct gymnasticization with the end-goal of a more athletic, collected horse in mind, and happier, healthier horses in the long run. A Blueprint for the Serious Rider. “This is a work book, a blueprint for the serious rider. After the training sessions I had with Miguel—when I was back home riding, I suddenly had a whole new vocabulary of school movements, of techniques to apply. In the second half of the book, Beran With stunningly beautiful photographs and clear descriptions, classical dressage authority Anja Beran breaks down the physical requirements of the rider’s seat on the horse and is joined by her personal physiotherapist and dance teacher for an in-depth look at human anatomy and how it functions in conjunction with the horse. Practical exercises give readers easy ways to improve mobility, strength, stability, coordination, perception, and overall posture, with superb results. Over the course of her riding and horse training career, Kathrin Roida has progressively gained a deep appreciation for the benefits of gymnastic exercises, particularly those that can be taught to the horse from the ground. “In-hand” training has long been used to help develop the dressage horse, conditioning and suppling his body while at the same time preparing his mind to grasp the movements that may eventually be expected under saddle. Christoph Hess, a FEI Judge in both dressage and eventing, is highly respected around the world as a teacher of riding and the development of the horse according to classical principles. Here he collects some of his very best riding and training tips along with well-honed insight related to the topics that he finds most often challenge equestrians and their equine partners. 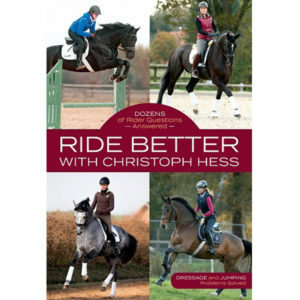 Ride Better with Christoph Hess provides thoughtful, easy-to-apply advice when dealing with issues with the gaits, in particular the walk and canter; high-headedness or the horse that is “too light” in the poll; inconsistency of performance; leaning on the bit; falling out; lack of straightness; and much more. Throughout Hess emphasises that a rider must always strive to improve, for the simple reason that you can always do better for your horse. While competitive and training goals do, of course, bring a certain satisfaction, it is having an equine partner who is contented in his work and happy in your company that rewards most. 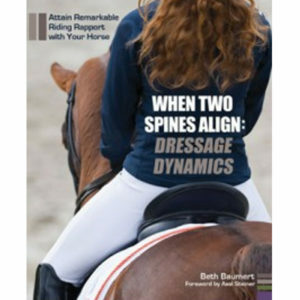 This lesson, and all Hess’s tips and solutions, are invaluable to equestrians of every level—everyone can walk away from this book a better rider. 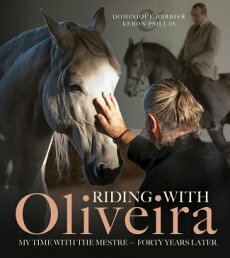 Over several years Barbier had the unique opportunity to form an intimate relationship with Mestre Oliveira, and in this deeply personal book he chronicles their time together. Understanding the weight aids in pictures. Forward by Charlotte Dujardin. This book is a visual guide that shows how each tiny shift of the rider’s weight affects the horse’s balance.Although the basic aids are taught at the most elementary levels of equitation, renowned classical dressage trainer Sylvia Loch feels that most riders never fully realise how their weight when mounted impacts the horse in hundreds of nuanced ways–both good and bad. With dozens of illustrations and fabulous colour photographs. Top international dressage rider Uta Gräf has made a name for herself as a trailblazer in the competitive dressage world as she strives to combine the highest levels of performance with natural horse care in observance of the needs of the equine body and mind. The first year under saddle sets the building blocks for the future of a riding horse: with a solid basic training he can do what is required of him willingly while remaining in the best of heath. This new edition has new photos and is updated by Ingrid Klimke. Based on sound practical and theoretical advice, this instructional handbook gives advice on establishing a specific training plan for recreational riders as well as competition riders to enable them to train their young horses successfully. Every aspect of the educational of a young horse is covered, including: – Basic education – Lungeing – Training under saddle – From suppleness to the development of impulsion – Cavalletti work – Jumping training – Hacking – Preparing for the first competition. Ingrid Klimke follows in the footsteps of her famous father, Reiner Klimke. A successful Olympic participant and European bronze medallist, she is one of very few riders to have achieved major successes at the highest level in both dressage and three-day-eventing. Those who work with and train horses on a regular basis are likely constantly searching for new ways to make inroads and find answers when faced with tough training or behavior problems. Grand Prix dressage rider and performer Yvonne Barteau has trained her share of horses over the years—from off-track racing Thoroughbreds, to Arabians, to Friesians, to Warmbloods—and she asserts that everything that needs to be known about effectively training a horse is already known…by any horse. Barteau believes that every dressage rider can learn to listen and read, and so experience greater success and partnership with his or her horse. In this book Barteau has used her knowledge and decades of experience and success in and out of the dressage ring to help put to paper what 10 different dressage horses would say to you about horse training if they could. Possessing the right mind-set and relevant mental skills has long been considered vital in achieving top performances in all sports. And yet, to many riders mental fitness still remains something of an afterthought. In Perfect Mind: Perfect Ride, the author demonstrates how to develop and achieve the right kind of attitude, motivation and mental skills to make the most of the rider’s abilities whether it be riding as a recreation or as a competitive sport. Horses are highly sensitive flight animals – they’ll react first and ask questions, well, never…! In essence, this means that every time riders get on their horse, they need to be fully committed, aware and in control of their body, their thoughts and their emotions, in order to communicate with their horse in precisely the right kind of manner. From the author of the highly successful titles How Your Horse Moves and Horse Anatomy for Performance comes a new training manual based on the philosophy that ‘understanding anatomy improves performance and reduces the risk of injury’. Divided into three main parts — Principles of Anatomical Riding and Training; Exercises for Horse and Rider; and Troubleshooting — the book contains a wealth of practical tips and exercises broken down into easy-to-follow, well-illustrated steps showing how riders can improve their riding skills and potential. 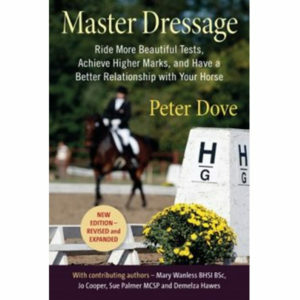 Using the steps of Accuracy, Fluidity, Understanding, Practice and Review this book gives readers a clear framework on which they can build confidence in their approach to dressage training and test riding. These steps reveal where readers could be losing valuable marks and arms them with the understanding needed to achieve much higher scores. After reading this book you will be able to have a better relationship with your horse, ride more beautiful tests and get higher marks. Within riding exists a fundamental conflict of interest: The rider needs to have control— confidence depends on ability to control the balance of own body as well as that of a very powerful horse. The horse, by nature, needs to feel free—free in both mind and body to express himself through physical movement. 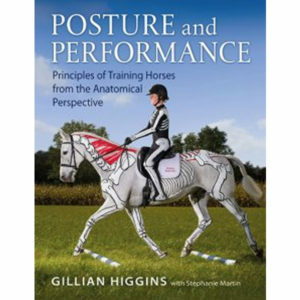 Readers will discover how to use “positive tension” and what the author calls the four physical “Powerlines”—Vertical, Connecting, Spiraling, and Visual—to become balanced and effective in the saddle. Readers will then find ways to understand and manage the horse’s balance and coordination challenges, including the fact that he is inherently crooked and naturally inclined to do too much with his front end and not enough with his hind. Every rider would like to ride their horse as well as possible, but how do we go about it the right way? This book explains why and, above all, how to classically train a horse, for example, we have to look at each horse as an individual – what problems does he have? How is his natural crookedness expressed? What is his personality like? This guide provides upbeat patterns/exercises that take the necessary task of essential schooling and add variety and challenge to everyday workouts, beat the dressage practice blues, and get the job done. Looking for new tools to add to your training arsenal and looking to create a supple, gymnasticized horse will delight in this fun collection of practice routines and photographs.